There are over 20 000 different species of algae of which Blanket weed is one type.With so many species it can be quite a challenge to differentiate between them. Blanket weed, however is the most common type found in garden ponds and is easily identified by its long filamentous threads. It has the potential to grow more than 2 meters in a day. With such a rapid growth rate, if not treated quickly enough it has the potential to cover your pond and block the filtration system. Prevention is certainly better than having to deal with the potentially fatal consequences of blanket weed by depriving fish and other aquatic inhabitants of oxygen. Why is blanket weed common to garden ponds? 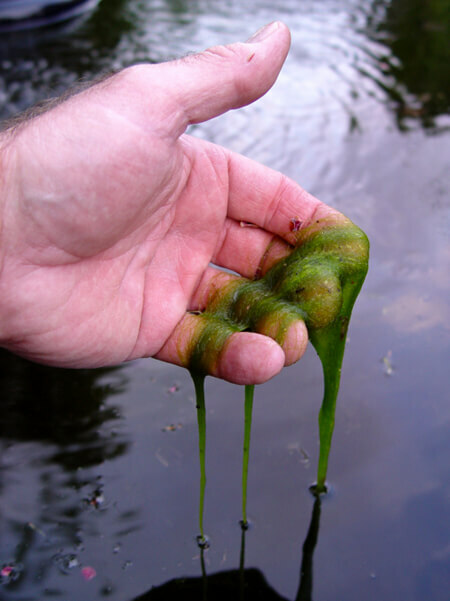 Blanket weed is a thread-like, filamentous algae that floats on the water. It forms a dense hair-like green mat attaching itself to rocks or to the side of the pond. If it attaches itself to oxygenating plants the algae will smother the plants preventing them from releasing oxygen into the water. Blanket weed thrives on sunlight and nutrients in the water. The higher the levels of organic matter the greater the chances of having to deal with this green filamentous algae. Any one of these five will increase the nutrient content in your pond. Blanket weed thrives on nutrients so it you want to reduce the risk of blanket weed then avoid nutrients entering the water. There are various treatments available from aquatic stores to treat blanket weed. For garden ponds home to gold fish or aquatic plants only then the introduction of pond snails is a wise choice. Snails will eat pond algae such as blanket weed, uneaten fish food and decaying matter. They are recognised as an ecologically safe way to control algae without the use of chemicals. For Koi ponds, use barley straw logs to rid your pond of algae. While high levels of blanket weed can be disastrous to your pond, in small concentrations they actually have the ability to cleanse and purify the water by using up organic nutrients present in the water. A pond completely free of algae may not be possible but keeping the nutrient levels low by following the above mentioned 7 points will go along way to a happy, healthy and well balanced pond. This entry was posted on April 10, 2018, in Garden ponds. Bookmark the permalink.